Preface: Here (plus the 570+ comments) and here. In the outer vestibule of upper hell there are people who post under pseudonyms. You can keep track of them, and they're honest about what they think. They have reputations to maintain. Really, they can't be blamed. After all, it's odd to speak (under your own name) to the entire blogsphere. Talk about public speaking! Google makes it even worse. Plus, pseudonymists can have specific, perfectly good reasons to avoid using their real names. So--they're merely in the vestibule, but I'm afraid they don't get to lounge in heaven, nibbling on cotton candy for eternity. Being brave enough to use your own name has to have its rewards. These people go by "anonymous" or "Fred" or "zippy," as it might be, but the main thing is that they don't always use the same name. So you can't keep track of them. They have no reputations to maintain, which can lead them into temptation. They'll wind up in the inner vestibule, next to the hot, hot door. If they're careful, it's not that bad. But cotton candy...no. These people (odd that they even exist!--see preface, link #1) indulge a strange vice--they post on blogs using multiple pseudonyms, for purposes of associating their opinions with a multitude. They may even make their aliases talk to each other, for pleasing effect. Pleasing to whom? It's not quite clear. These people are deceivers, but also fools, since they confuse a true proposition with one that has many adherents. Sixth circle of upper hell, alongside the heretics, seems like a fitting place for them. Puppeteers who want to be taken especially seriously will sometimes resort to identity theft (amazing but true--see preface, link #2), claiming that one or their aliases is such-and-such a real person. Thus, the real person unwittingly becomes associated with whatever view the puppeteer is trying to promote. The torments of lower hell (alongside the thieves in the 8th circle) are a suitable recompense. Burns, festering sores, relentless itching, the whole nine yards. Nice to know where I fit in. Faust, I sometimes post pseudonymously or even anonymously at other sites, so don't worry, we can play chess or something while we envy the cotton-candy eaters. Ooo I'd like that. I like chess. OR we could discuss Surviving Death. That's quite a bit like chess. And would be quite relevant to our vestibular condition! Have your received it yet? I have some recommendations for reading. Got the book, but I also ordered another book that comes first. So...soon...this summer. Writers or academics who have a public posture are in a very different position than those of us who free lance or work in jobs where conformity is needed. In fact, many writers and academics use blogs to seek recognition for their ideas or to advance their careers, which is reasonable. However, many of us work for a variety of employers, who often scrutinize our public political or philosophical postures; and any heresy or lack of conformity with what the employer or prospective client demands of one's thinking can cost one dearly. I know several people whose public presence in Google (from which there is no exit) has kept them from getting jobs for which they are more than qualified. A friend of mine, a history teacher, who has blogged extensively about the sad state of Chilean education, now works selling real estate, since he does no find work as a teacher. Amos, I entirely understand all that, so all humor aside, maybe the no-name posters don't even belong in the vestibule. Faust, Funny you should ask. I'm listening to Paul Bloom's new book about pleasure (during endless chauffeuring of daughter to horse camp and back) and the last chapter was about cannibalism. Very, very interesting (but creepy). My name (Ed Harris) is so common I could use it and most people would not identify it with me specifically. Maybe I should post as Ed Harris from Gainesville FL? Nope! The phone book tells me there are six of us out here. Hmmm. An intriguing taxonomy. 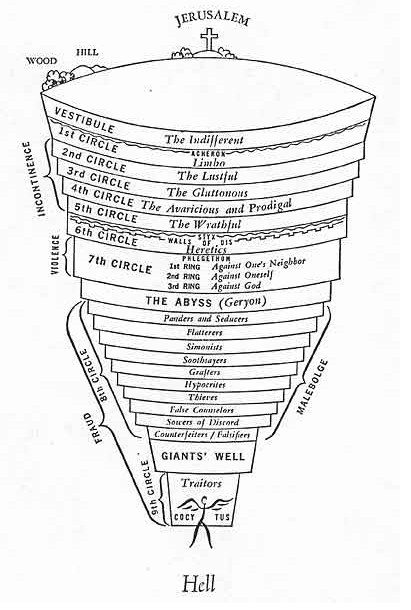 Though for the sake of consistency with Dante, I think I would put "Lurkers" above the Vestibule but below Jerusalem. Lurking is reading without commenting. Why is that even slightly bad? I don't know, why is indifference bad? Ask Dante. Ha. Maybe you're right. I have the feeling if I worked on it I could come up with a lot more internet sins. Too much blogging is actually one of the most worrisome but maybe it's just a form of gluttony or indolence. I need to work on this. 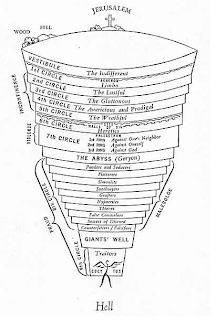 I just figured that various kinds of trolls would occupy the fifth circle and below. Though identity thieves might very well belong in Cocytus.